Are Above Ground Pools Cheaper Than Inground Pools? Posted on August 9, 2018 August 2, 2018 , in Above Ground Pools. Chances are if you are considering installing a pool in your yard, you are beginning to calculate the approximate costs and prepare a budget. Often, prospective buyers will look at the hefty price tag of an inground pool and immediately think that there is no way that they can afford to own a pool. The good news is that there is another option, above ground pools, and these are not the flimsy, inflatable models that may come to your mind. Not too long ago, an inground pool was pretty much the only type of pool you would see installed at someone’s home. In recent years, the popularity of above ground pools has begun to expand. Above ground pools can be very low cost – head to your local department store and you will be able to buy some type of entry-level model off the shelf. Unfortunately, this is usually where above ground pools get a bad reputation as these cheaper models typically will not last more than a couple of summers. What some pool buyers are often not aware of is that there are many excellent, quality above ground pools available from reputable dealers. 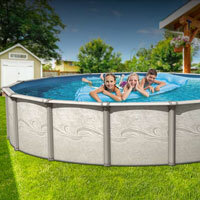 These pools are a great option as they cost less than an inground pool and are durable, enjoyable and built to last. If you want to have access to summer swimming fun in the comfort of your backyard but do not want to break the bank, a really high quality above ground pool is a great option. Keep reading below to find out why above ground pools are such a great choice. One of the best parts about an above ground pool is that it is not permanent. The installation is relatively quick and they can be moved when needed. Instead of having to hire a contractor to dig a large hole in your yard, which can cost a lot of money, your above ground pool can simply be delivered or moved into the location where you want it. No matter what type of swimming pool you have, equipment and chemicals to keep your water clean and sanitary is a must. Above ground pools are typically smaller, meaning they require fewer chemicals and take less water to fill, which not only costs less but takes less time to clean and maintain. For those with small children or pets, pool safety is a concern. Although it does depend on how your pool is installed, typically an above ground model is more difficult for a child or pet to fall into. No matter what type of pool you have, if it is built into a deck, a lockable fence surrounding the pool is always recommended. Lower installation costs, fewer chemicals, less maintenance equipment and smaller pool sizes all contribute to the lower price tag of choosing an above ground pool. And just because the price is lower doesn’t mean it won’t last. With today’s quality models and design, an above ground pool that is well maintained can last between 10 and 25 years. Finally, if you are worried that by choosing an above ground pool will mean that you will be missing out on features, don’t be. There are plenty of options and accessories available including water fountains, waterfalls and diving boards as well as a variety of sizes and finishes. Now that you know about the benefits of above ground pools, download a brochure to find out more details about the Discovery model.